Inventory We are a resale marketplace, not a box office or venue. Ticket prices may exceed face value. This site is not owned by The Fillmore Detroit . 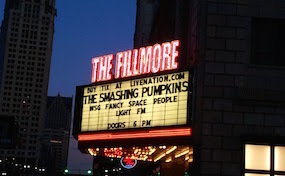 The Fillmore Theatre Detroit has been in operation since 1925 and is now operated by Live Nation. The Fillmore Detroit box office is located at 2115 Woodward Avenue. The venue underwent a major renovation in 2007 before being rebranded as The Fillmore. The current seating capacity is 2,888. The Fillmore is listed under the US National Register of Historic Places. The Fillmore Detroit hosted American Idol in 2015. Theatre-Detroit.com is a privately owned and operated company that concentrates in the online retail of all events in the resale secondary ticket market. We are not associated with any primary website, box office, and or official supplier. Tickets on our sites tend to be above face value, but will change quickly with market conditions. To order tickets to any The Fillmore Detroit events please call our operators at anytime or follow the process online through the checkout.